This is the best cruise-in of the winter season. Come check out the many cars that come out, and CBI's unbelievable inventory of great products, many currently on clearance. Huntsville Car Scene will be providing event coverage of this event. 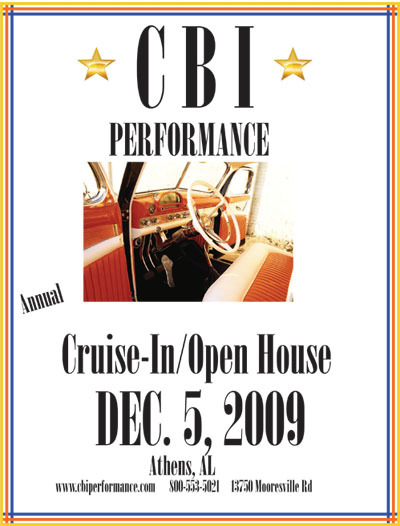 It has been many years since I've been to CBI's open house, and it is still going strong. This was the 20th year of the event, and like many years in the past, there was some warehouse space available for indoor parking. Many cars actually came the day before to secure their parking spot. Well over a hundred very unique and rare cars came to the event including a Mercedes Mclaren SLR. This is only the second time in my life that I've ever seen one of these in person, and it is by far the most expensive car that I've ever photographed. This car retails for over half a million dollars. It actually belongs to one of CBI's vendors and race team owners. And the car owner, mpickens was gracious enough to let our Christmas elf, Elodie, model with the car. It's the first time in my life that I wished I was the model. Elodie is a professional model with PAMA Agency here in Huntsville. PAMA Agency has highly skilled talent available, and is where most of the talent used in local print, television, film, and events comes from. Elodie is of French heritage and speaks fluent French. She had a great time at the event (even though she was freezing), and I think we can expect to see her again next year. Special thanks to both her mother and friend for coming and helping out. Among the hundreds of spectators that came to the event, there were quite a few new and old friends that I hadn't seen in a long time. One friend I was very glad to see back up and about was Doug Poole. He suffered a bad car accident shortly before his show earlier this year. It was so good to see him back to his old self again. Special thanks to Misty, Jeff, and all the people that helped with the event. Be sure to support CBI by checking with them for all your automotive, performance, and restoration needs. I only recently learned they fill nitrous bottles and stock performance fluids from Red Line. Looks like I won't have to hunt all over Huntsville for these products anymore. See everyone next year! Everyone come out this is a great event some inside parking if you get there early, free food, free to show, but to be eligble for door prizes you have to buy a door prize ticket. Misty and Jeff are great people they sell parts for every kind of car. If you want indoor parking get there early the show fills up fast. I have been going for almost 20 years and it get bigger every year the pretty kool for a show in december. Indoor parking varies as it depends on if the neighboring warehouse is empty or not, so don't depend on it. Misty always tries her best. Charlie has the warehouse empty already being that he opened the stored and the christmas show was started by him. Misty and Jeff have only owned the store about 4 years. Will be there in the Z, I was really hoping to have the 57 finished but it doesn't look like its gonna happen. Looks like I'm gonna be out of town that weekend. I was really wanting to come to this, too! This weekend is turning crazy busy. Both the British car club and the Porsche club have their Christmas parties this day too. Seems like everybody's going to pick this day for an event. Last edited by Samir; November 6th at 01:48 PM. Thanks for the thread, Samir. Unfortunately, the warehouses are currently not available for indoor parking. We will try everything we can, but those warehouses being full equals a much-needed source of income for us, so hoping for space to come available it counter-productive to the bottom line. LOL. There may be some things we can shift around and combine to make room, but as of right now, indoor parking will likely not be available. Hopefully, that won't deter anyone from coming out. I hope it won't deter anyone from coming. This is the best open house in our area and one of the best car events of the entire season. It's always a blast. I'm glad everyone enjoys the show. We certainly look forward to seeing everyone. We have many who we only see in person at the Open House, we spend the rest of the year dealing with them over the phone. As of now, food will be a go, as usual. We hope to have another big turnout this year. Just wanted to let everybody know, there's no need to wait until Open House to come by. Misty and the guys have a HUGE clearance sale going on now, so y'all come by and check out the "Get it out the door" prices! I've stopped by a few times, and the stuff they have is HEAVILY discounted. If you're looking at stuff in JC Whitney or JEGS, give them a call first. You may find those headers you've always wanted at a price you only dreamed. What time do people usually start showing up and when will the places and door prizes be done? Edit: Just left her a message. Last edited by Samir; November 30th at 08:47 AM. I believe that CBI's event starts around 8 am; and that I am sure many show up early. We did our first year as we came as a group with Just Kruzin. After that, Chip & I usually get there between 10 and 11 a.m.
Just got off the phone with Misty from CBI. Smaller door prizes will be awarded throughout the day. The larger items will be aiming for around 1pm. This is, of course, subject to change. Be sure to get some door prize tickets. There's a TON of great stuff that will be given away. New for this year is also a separate spectator parking area. This way, the nice cars aren't mixed in with the regular ones. Weather is looking to be clear and nice so far, so this is poised to be one of the best years for this event. Sweet. What time will you get there, Samir?